Links to this page can be found in Book 6, Day 1, Map A4, View C9 and Rione Monti. 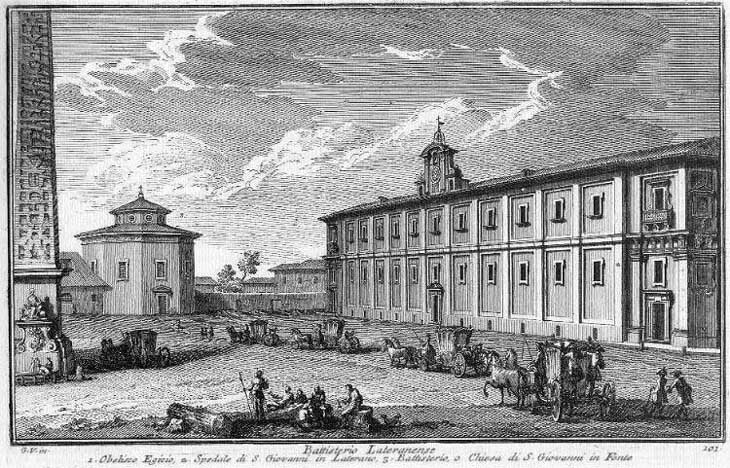 This is one of three views of Piazza di S. Giovanni in Laterano by Giuseppe Vasi; the others are in plate 34 (named after the piazza) and in plate 172 (Spedale di S. Giovanni). The focus of this plate is on the Baptistery, but Vasi took the opportunity for showing the hieroglyphs of the obelisk and a view of the Men's Ward of the hospital. 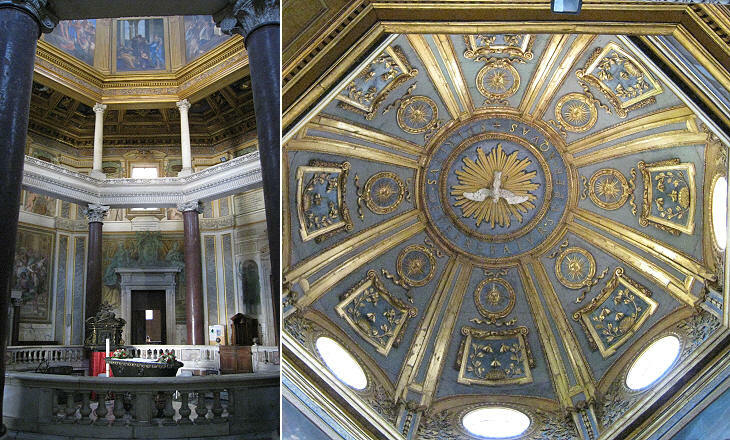 According to tradition S. Giovanni in Laterano had been the first parish church of Rome. Vasi had depicted the Basilica in Book III so he dedicated a view to the Baptistery in his introduction to the Parish Churches of Rome in Book VI. The view is taken from the green dot in the small 1748 map here below. In the description below the plate Vasi made reference to: 1) Obelisco Egizio; 2) Spedale di S. Giovanni; 3) Battisterio. 1) and 2) are shown in detail in other pages. The small map shows also 4) the location of Roman baths which were found inside some old buildings in 1936. In the XVIIIth century Piazza S. Giovanni in Laterano was a busy place only during Possessio, the ceremony by which a newly elected pope took possession of his charge as Bishop of Rome. The monuments shown by Vasi have not been modified, but in 1936 the opening of a new road between the Baptistery and Spedale di S. Giovanni revealed that some houses incorporated the remains of ancient (private) Roman baths. For centuries the main entrance to the Baptistery was from the opposite side: it was preceded by a Vth century small portico with two porphyry columns. In 1575, in the frame of the redesign of the whole Lateran area, Pope Gregory XIII opened an entrance from the square; it was the beginning of a series of modifications to the building which lasted for almost a century until they were completed by Pope Alexander VII in 1667. The Baptistery was built by Emperor Constantine and it probably had a circular shape which was turned into an octagon in the Vth century. According to Liber Pontificalis, a medieval chronicle of the lives of the popes, the Baptistery was provided with facilities for administering baptism by immersion. The official name of the building was S. Giovanni in Fonte (spring/fountain). Throughout the Middle Ages Emperor Constantine was regarded as almost the co-founder of the Church; during the Renaissance his historical role was shadowed by interest and admiration for his predecessors, chiefly Emperors Augustus and Trajan. In the XVIIth century the Roman Church started to emphasize again the importance of Constantine. Pope Urban VIII promoted the decoration of the interior of the Baptistery with large frescoes depicting events of his life. 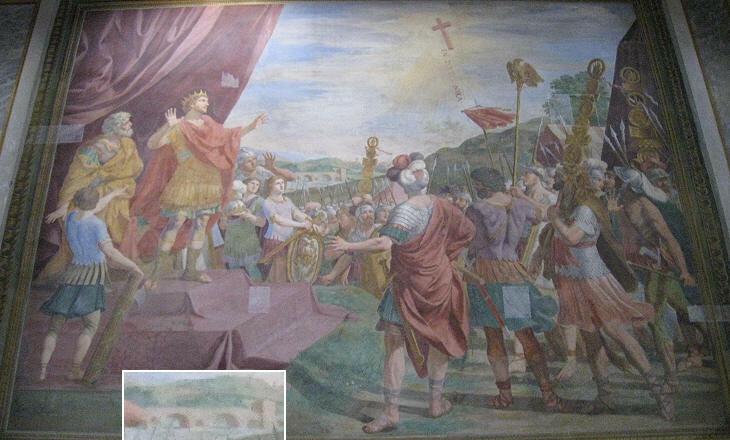 The ultimate objective of these frescoes was that of establishing a symbolic link between the Emperor and the modern monarchs who fought for the Roman Catholic faith. At the time of the frescoes the Habsburg Roman Holy Emperors were trying to restore Roman Catholicism in all their domains in the course of the Thirty Years' War, one of the bloodiest conflicts in European history. The Baptistery was modified in the Vth century by Pope Sixtus III, the founder of S. Maria Maggiore. He embellished the building with mosaics and marble inlays of which fragments can still be seen in the former entrance (it was turned into two chapels after the opening of the new one). 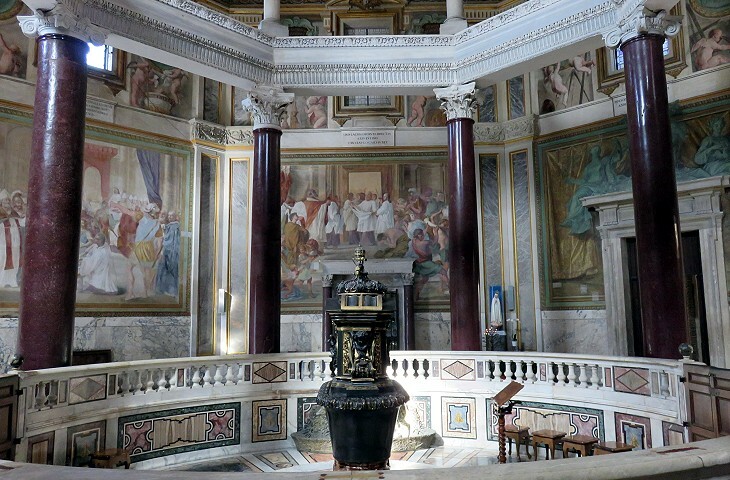 A chapel adjoining the Baptistery Hall was built when Rome was ruled by the Byzantines by two Greek-speaking Popes: John IV (640-642) and Theodore I (642-649). 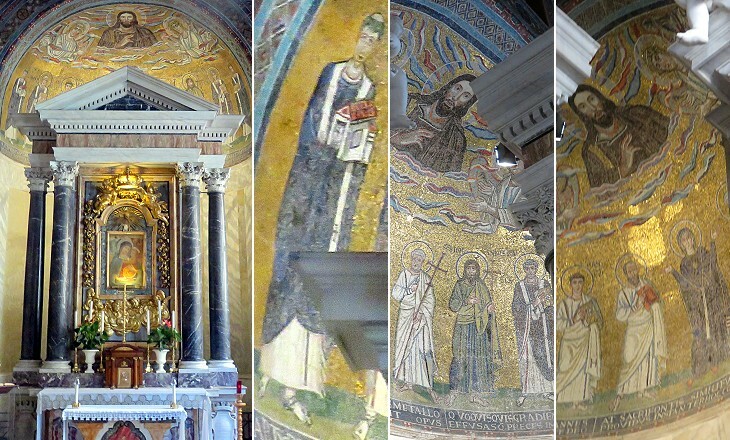 The mosaic in the apse shows the two popes flanked by saints and below an image of Jesus Christ Pantocrator. 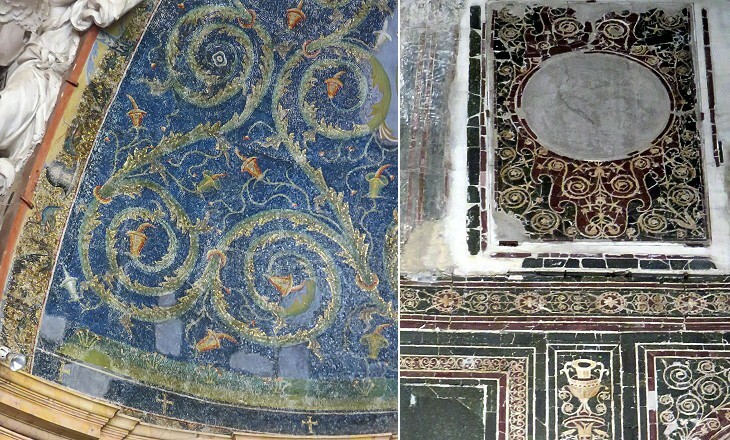 The mosaic was restored in the early XIXth century. The Baptistery was regarded as a very holy place and many prelates chose to be buried there. 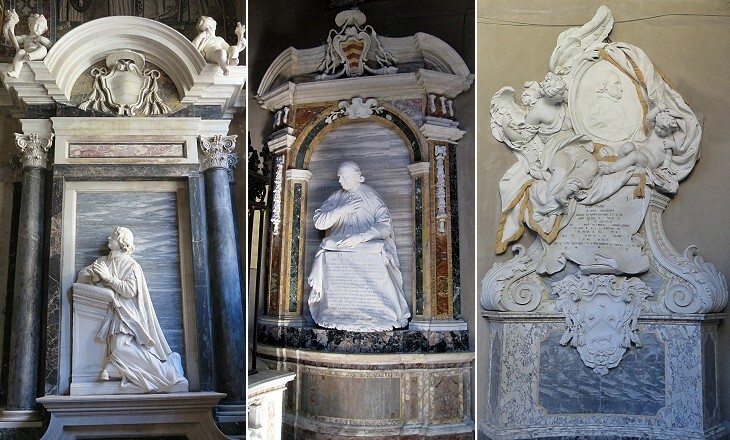 Their monuments follow two patterns which were established by Gian Lorenzo Bernini: the dead were portrayed in the act of praying or a portrait of them was placed inside a medallion. Some sources attribute to Pope Sixtus III the erection of eight porphyry columns at the centre of the Baptistery Hall. Other sources state that they were put in place by Pope Sergius III in the early IXth century. The columns support a series of ancient capitals and lintels. 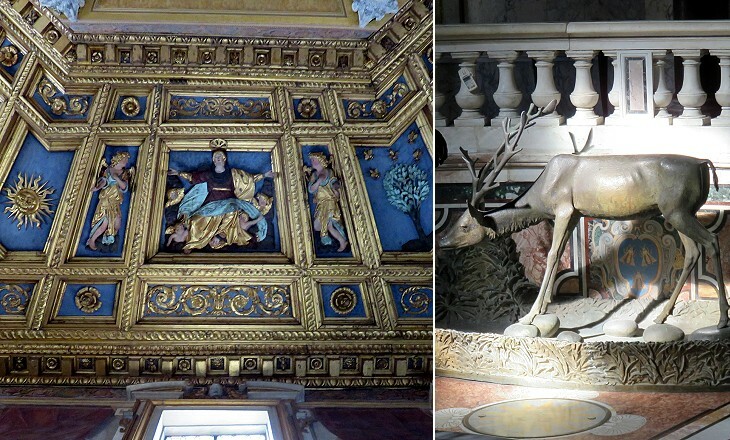 They are so beautiful that they were not touched by the XVIIth century redesign of the Baptistery Hall. The redesign of the interior in the XVIIth century built upon the existing eight columns by adding a second tier which supported a very elaborate wooden ceiling. 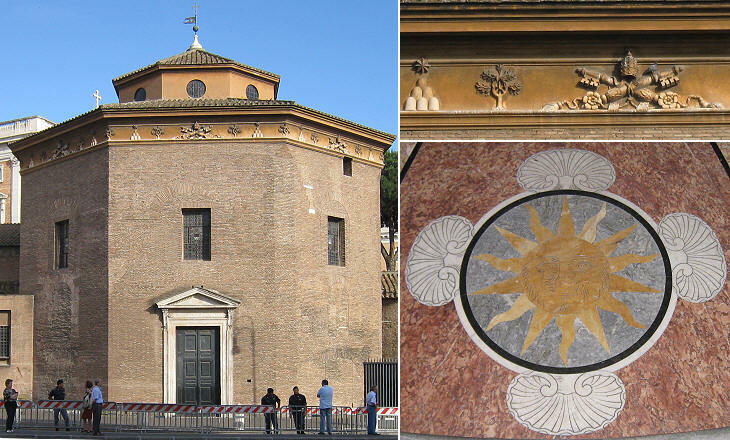 The octagonal shape of Battisterio Lateranense and many other baptisteries is associated with the "eighth day" being the Day of Resurrection. A long inscription (presumably dictated by Pope Sixtus III) on the lintels above the porphyry columns ends with the following words which highlighted the importance of Baptism: Nec numeros quemqua scelerum, nec forma suorum terreat: hoc natus flumine, sanctus erit (Neither the number, nor the gravity of the sins should scare anyone. Whoever was born in this river - e.g. was baptized - will be saved). Next plate in Book 6: S. Maria in Campo Corleo. Next step in Day 1 itinerary: Porta S. Giovanni. Next step in your tour of Rione Monti: Piazza di S. Giovanni in Laterano. Intanto volendo noi con brevità, e con puntualità ancora osservare le antiche, e moderne cose, che appartengono a questa Basilica, bisogna cominciare dal Battisterio, o vogliamo dire Fonte battesimale. Siccome gli antichi Padri ebbero somma cura nell'amministrare i Sagramenti, così il Pontefice s. Silvestro, veduta stabilita la pace alla Chiesa, pensò di edificare presso alla basilica Costantiniana un magnifico Fonte, che per la liberalità di Costantino fu guarnito tutto di porfido, e da ogni banda fu ricoperto di tre mila e otto libbre di argento; in mezzo al Fonte si alzava un vaso di cinquanta libbre di oro, in una lucerna con li stoppini di amianto sì abbruciava balsamo; vi era un agnello di trenta libbre di oro, che gettava acqua, alla cui destra era una statua di cento settanta libbre di argento rappresentante il ss. Salvatore alta cinque piedi, ed altra simile di s. Gio: Battista con in mano l'iscrizione: ECCE AGNUS DEI, ECCE QUI TOLLIT PECCATA MUNDI Vi erano ancora sette cervi ciascuno di libbre ottanta di argento, che spargevano acqua; ed un vaso da profumi di dieci libbre di oro, guarnito da circa 42. tra smeraldi, e zaffiri. I1 Medesimo Costantino aveva fatto condurre in Roma alquante maravigliose colonne di porfido per adornare il fonte: ma non essendo state messe in opera, e restando pel corso di tanti secoli devastate, e derelitte quelle magnificenze, Sisto IV. ne drizzò otto, e sono quelle, che ora reggono la cupoletta ottangolare, nella quale si vedono i bei quadri dipinti da Andrea Sacchi. Vi si conservano le due cappellette, una di s. Gio: Evangelista, e l'altra di s. Gio: Battista in memoria dell'oratorio, che da s. Ilario Papa vi era stato fatto, e sono ornate di mosaici e statue di metallo. Nel giro d'intorno sonovi delle pitture a fresco, fra le quali, quella , in cui si rovinano gl' Idoli, è la prima pittura a fresco fatta da Carlo Maratti. Sieguono due celebri cappelle, una eretta l’anno 1253. da Anastasio IV. dedicata alle ss. Ruffina, e Seconda, nella. quale sono i corpi delle ss. Titolari, e di altri Martiri, e vi si vedono quattro grosse colonne di porfido con alcune anticaglie; l'altra eretta fu l’anno 640. da Giovanni IV. per collocarvi il corpo di s. Venanzio con altri santi Martiri, che si vedono rappresentati nel mosaico della tribuna; in oggi evvi un nobilissimo altare dedicato alla ss. Vergine, ornato con depositi di marmi, e di sculture secondo il disegno del Cav. Algardi.